Figure1: Analysis of the balanced primary energy demand related to the net present value for the different technology combinations for case study Solallen. Already today buildings can be realised in the nearly zero and plus energy standard. These buildings achieve extremely low energy demands and low CO2 emissions and can be operated economically. For this reason, the motivation in the CRAVEzero project is not only based on the energy characteristics of buildings, but also on their life-cycle costs. However, the broad market deployment of these buildings is progressing very slowly so far, as methods and processes for the cost-optimal integration of efficiency measures and renewable energies are not yet sufficiently described and therefore not yet common. 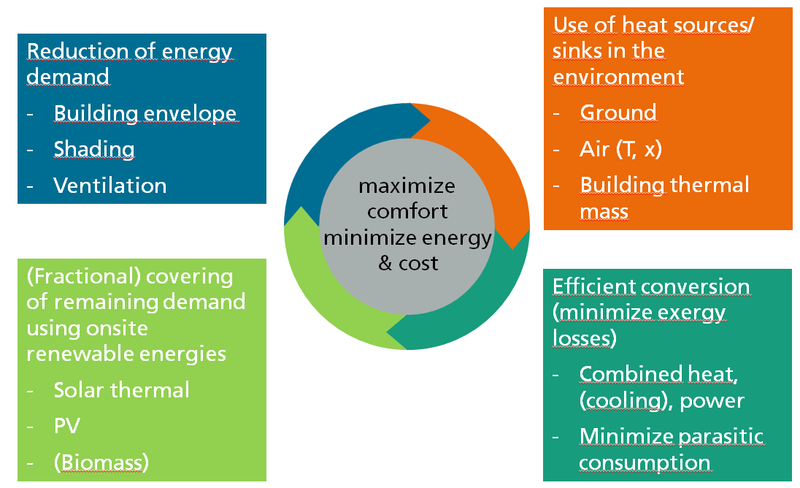 As a consequence – many poorly planned buildings are criticised for the fact that the actual energy consumption of highly efficient buildings is higher than the predicted demand and that high-efficiency standards are expensive and uneconomical. The influence of the user behaviour of such energy efficient buildings is another aspect, which has to be considered to evaluate the impact on the energy consumption of the building. The identification of suitable methods for the energetic-economic optimisation of highly efficient buildings in all life-cycle phases is a prerequisite for the broad market implementation. On the basis of the results, the statement is confirmed: nZEBs are economical. It can now be shown that the additional costs of efficiency measures are so low that highly efficient buildings have the lowest life-cycle costs. nZEB measures only have a small percentage influence on construction costs, but can reduce CO2 emissions many times over. When considered over the service life, these measures are usually cost-neutral or even economical as can be seen in Figure 2. Different technologies are necessary to achieve the energy standard of nZEBs.​​ They can be summarised in three​​ main categories​​ (i)​​ Passive Energy Efficiency solutions, (ii)​​ Active Energy Efficiency solutions​​ and (iii)​​ Renewable​​ Energies. All approaches/ technologies are needed in order to realise nZEBs. And all of them play a major role in the CRAVEzero frontrunner buildings! An excellent thermal insulation​​ and air-tightness of the building are of major importance, which can be seen in the rather low U-values of the building envelope elements in the case study buildings (opaque elements​​ between​​ 0.07 and 0.25​​ W/(m²K), windows mainly between 0.7 and 1.2 W/(m²K)).​​ In addition to adequate insulation, shading, usable thermal mass, natural ventilation and passive cooling possibilities are essential to minimise the energy demand of the buildings. For the supply of the remaining energy demand for heating and cooling, highly efficient technologies using – if applicable – renewable energies should be installed. In the case study buildings, mainly heat pumps and district heating with low specific emissions are used – in several cases in combination with solar thermal. Boilers only play a minor role (see figure below). In addition and for the integration of renewable energies, in most buildings thermal storages are installed. Concerning renewable energies, solar technologies and specifically PV are the dominant technologies used in the CRAVEzero frontrunner buildings (see figure below). Both​​ PV and solar thermal​​ are well developed and relatively easy to install on or at buildings.​​ They do and will play a major role in nZEBs as these buildings are only possible with the use of onsite renewable technologies. A detailed description of the technologies installed in the CRAVEzero case study buildings can be found in the recently published Guideline II: nZEB Technologies available here.